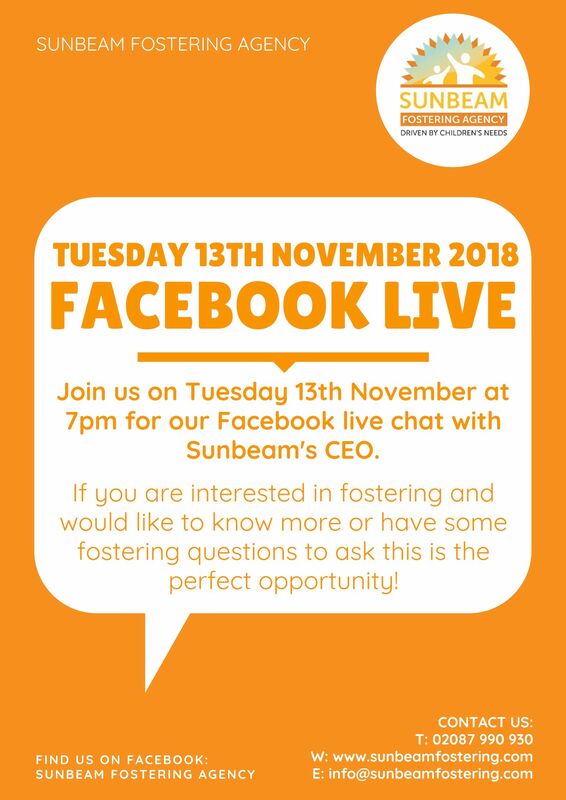 On Tuesday 13th November 2018 at 7pm we will be going live on Facebook with Sunbeam’s CEO. If you are interesting in fostering, or have some interesting questions you would like to know the answers, join our live. It is also an excellent opportunity to get to know more about Sunbeam Fostering Agency! Don’t worry if you are unable to join our live session, you can call us on 02087 990 930 to speak to a member of our team. We also have lots of great information on our website and be sure to check our social media pages to keep up to date with us! To visit our Facebook page, please click here! We look forward to chatting with you shortly.